is CFXpoint.com a legit broker? I’ve searched all of the internet but couldn’t find one post or review about them. When I checked their Google Playstore App their e-mail adress for contact was a gmail.com adress which doesn’t sound like a professional broking company which I should trust. I’ve done some more research and it’s clear that they’re a scam. 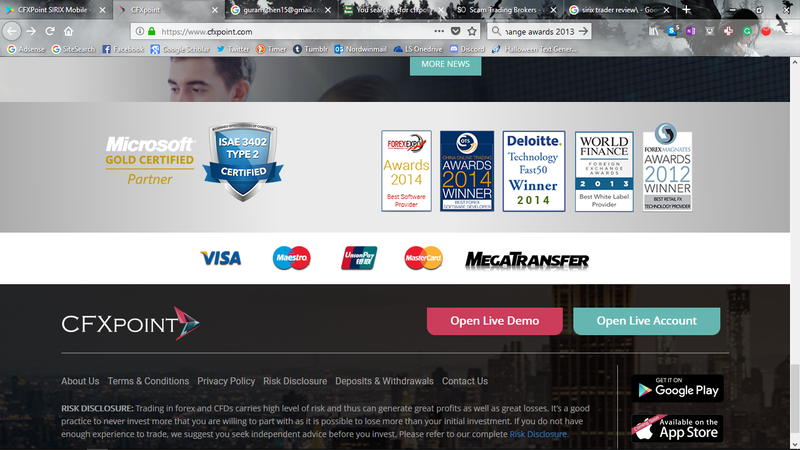 On their website they have claims like being “Winner of the ForexExpo Awards 2014”. Does anyone have experience with CFXpoint.com and can someone give me a second opinion on this company? CFXPoint is not displaying a Forex brokers license on their website. All they say is that they are based in the Marshall Islands with a United Kingdom phone number. KLDC Technological systems LTD (Ajeltake Road, Majuro, Marshal ISlands). Hi I am a new bee to the trading. I talk to a guy name James Anderson and he sounds like a good honest person so I deposit fund with them. He told me to give them 14 days than I will see the profit and how my account grows. Its 2 weeks now and nothing has happen. I send him how many emails but no replies. I don’t think cfx is real. Hi Andres. I have the same problem. But are you saing that after 3 months, we can leave the company? I dont get any answers on my email I have sent them.